Professor Charles Xavier, founder of the Xavier Institute for Higher Learning, has spent his whole life fighting for peace in a chaotic world. Together with his X-men, a team of talented young mutants who share his vision, they struggle for understanding in a world that hates and fears them. And lately, the world has had plenty of reasons. One threat comes from the Brotherhood, a group of mutants led by Charles Xavier’s old friend, Erik Lensherr. Unlike the X-men, they seek to dominate humanity by force and have been actively working towards their ambitious goal with a series of plots. It started with an initial recruitment of new members including Pyro, Blob, Toad, and Avalanche. It extended to incidents that led to a confrontation with Weapon X and an incident with the mutant singer, Dazzler. Now Magneto’s message is permeating through mutant communities all over the world, including the subterranean mutant society known as the Morlocks. But as Magneto’s plot grows, so too do others. The other major threat comes from Genosha, a small island nation run by a military dictator named Cameron Hodge. Recently, Hodge has been spearheading a bold push to aggressively contain mutants like the Brotherhood. His dealings have led to incidents that drew a young mutant named Kitty Pryde into the mix. The X-men were able to save her, but now they stand in a difficult position between two volatile forces. The world is just one major incident away from an all out human/mutant war. 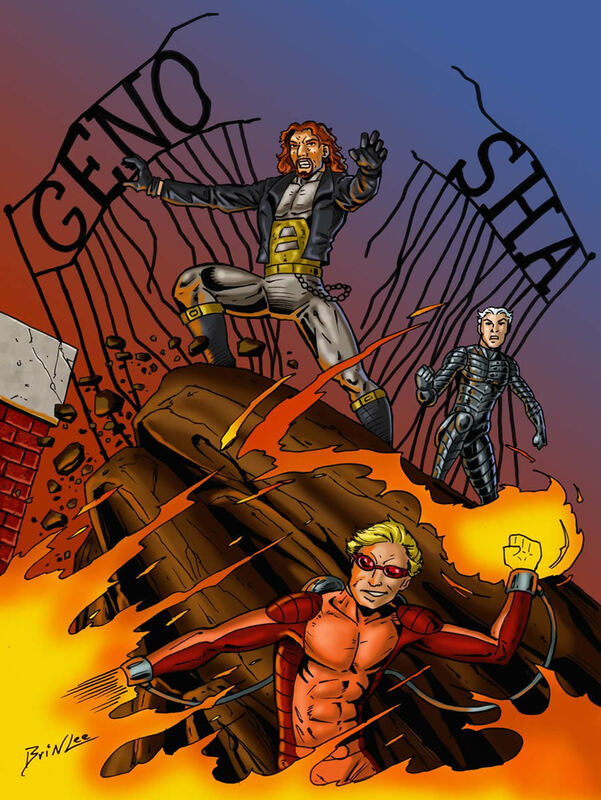 The area surrounding the embassy for Genosha was one of the most heavily guarded areas in Washington DC. Only the White House could possibly boast better security. Every square inch within several blocks was heavily monitored. Armed guards from the Genoshan army, bearing the distinct dark blue/purple uniform insignias, surrounded the perimeter with high powered weapons. This was not a place for tourists or visitors. In delicate times like these, no one was taking any chances. Inside the heavily guarded embassy, the regime of Cameron Hodge extended even across oceans. Everyone from the janitorial staff to the top ambassador was scrutinized. The unspoken rule of thumb was that their great leader had eyes and ears everywhere. No one dared even think about stepping out of line, especially at a time like this. With the recent difficulties they faced in the Chicago incident, nobody could afford to slip up again. In the top floor office of the embassy the Genoshan ambassador, Colonel Jonathan Kincaid, was in the middle of a secure video conference between Cameron Hodge and a group of advisors. Over the line Cameron Hodge’s expression hardened. There wasn’t even a hint of concern. If anything he looked annoyed. “How soon?” asked the Colonel. Colonel Kincaid still had plenty of concerns, but he trusted his leader’s bold words. General Hodge grinned ominously on the video screen, sending a chill down the spines of even his trusted advisors. “Yes sir,” said Jonathan Kincaid with a loyal salute. The video link then went offline. Colonel Kincaid and the rest of his officials remained anxious, but they trusted in their leader’s wisdom. He had led them all this far. They had to have faith his master plan would come to pass as he promised. The Colonel and his subordinates began gathering their things and prepared to get back to work. But just as they were about to get up, a strange tremor shook the room. It was minor at first. It barely made the lights flicker. But it quickly caught everyone’s attention. “Sir, is Washington DC near a fault line?” asked one of his younger subordinates. Colonel Kincaid’s expression became as dark as midnight. Before another word could be uttered, the lights completely cut off. Then in the span of a few seconds the tremor turned into an all out earthquake. The entire building shook violently, causing nearly everybody inside to fall over and cling desperately to anything they could. Confusion soon turned to panic and panic quickly became all out terror. “Colonel! What’s going on? !” exclaimed a terrified female secretary. But that was all he got out. Before anyone could begin to comprehend the gravity of this situation, a deafening crash came from all directions and everything went black. The young mutant was seething with intent as he stood just outside the secure boundaries of the embassy. He, Pietro, and John had casually pulled up in an unmarked black van. They then fearlessly approached the secure perimeter and made their move. Pyro scorched the guards while Avalanche kicked up his strongest tremor yet. Their objective was simple. They were to destroy the Genoshan embassy and send a message to Cameron Hodge. It was a message he was sure to receive loud and clear. Sidewalks cracked and the surrounding streets warped to the seismic upheaval. Nearby guards lost their balance and fell into disarray as the peaceful late morning turned into utter chaos. The epicenter of the attack was focused right on the foundation of the imposing structure. The entire north side of the structure cracked as windows shattered and the foundation shuttered. “Trust me! Nobody will survive this!” grinned Avalanche. Clutching his fists, the young mutant unleashed another wave of seismic force. This delivered the death blow to the structure. A massive crack formed from just in front of him and spread directly to the foundation of the building. When it hit, the deafening sound of concrete shattering and steel beams warping echoed throughout the area. As the ground shook violently, the whole embassy crumbled under its own weight. The faint cries of the inhabitance could be heard as the structure came down in a plume of dust. But the Brotherhood showed no mercy or compassion. As far as they were concerned, these were tools of Cameron Hodge and deserved no sympathy whatsoever. Lance kept the tremors going, making sure every last part of the building collapsed and crushed any survivors that may be inside. While he took down the building, Pyro used his fire manipulation powers to literally torch the perimeter guards where they stood. “Hahahahahahaha! Just another shrimp on the barbey, eh mates?” he laughed as he heard the pained cries of the Genoshan guards. The inhabitants in the embassy and the surrounding guards didn’t stand a chance. Anybody who tried to fight back was quickly identified and disarmed by Pietro, who did a quick run-through of the area to make sure there was nobody left. The hapless Genoshans never had a chance. While this was going on, terrified onlookers and news helicopters gathered around the area. This was in broad daylight in the middle of a sunny day. There were bound to be witnesses and the Brotherhood was counting on it. Magneto wanted them to make a statement that would draw as much attention as possible and this was sure to do the trick. Some people were already running in fear. And there were a number of perimeter cameras that are still active. When Lance stopped his seismic onslaught he turned to one of the cameras and flipped it off. “You watching this, Hodge? Your days are numbered! You and the rest of the human race are going down!” he proclaimed. “Easy Lance, I thought Pyro was supposed to be the crazy one,” snickered Pietro as he finished his sweep. “Sure you are,” grinned Pietro. More helicopters descended upon the area. Pyro made sure more took notice by setting the rubble ablaze as well. This would also do a way with anybody unlucky enough to still be alive. It left in their wake a truly hellish landscape and would surely draw the attention of the world. Having made their statement, Pietro looked up into the sky and signaled their escape. A few seconds later three metal transport orbs from Magneto flew in and opened up. They could already hear sirens in the distance so they hurried up and got in. But Pyro continued to linger, burning anything he could see. “Hahahahahaha! Burn baby burn!” he exclaimed. “Now Pyro! Unless you want to watch the revolution from a jail cell!” shot Pietro. Groaning to himself, Pyro stopped his onslaught and joined his teammates in the transport orbs. Smoke, dust, and debris were pouring out from the charred landscape. The ominous sight of death and destruction now dominated the once proud embassy. But the three members of the Brotherhood stood proud of their accomplishment as they flew away in the transport orbs. This one act of destruction was just a prelude. Soon the entire human world would know the same devastation. It had been a few weeks since Kitty Pryde joined the X-men. Like all new recruits, there was a difficult adjustment period. Joining a school for mutants was daunting enough, but when she saw the other aspects of the world of the X-men such as the Danger Room, the X-jet, and Cerebro she was a bit overwhelmed. But Kitty proved to be every bit as tough as she seemed. She took quickly to basic life at the institute and the more unique aspects of being an X-man. One of the first things she did when she arrived was learn more about her powers. Professor Xavier and Hank McCoy revealed that her mutant ability involved manipulating the vibrations of atoms in a way that allowed her to become intangible. This granted her the ability to phase through solid objects, which helped explain why that cup of yogurt passed through her that fateful day and how she was able to pierce the outer shell of that robot attack orb. With the help of some focused mind/body exercises, she was able to manipulate when and how she phased through something. She was a little clumsy with it at first, but she quickly caught on and was already participating in Danger Room sessions. It would definitely be a useful skill for the X-men in future missions. In addition to learning how to be a student and an X-man, Kitty was also getting to know her fellow peers. She quickly found out there were a lot of unique characters in the X-men. There was the grumpy and crass Logan, the uptight and dedicated Scott Summers, and the intellectual yet animalistic Hank. She had already befriended most of them and found herself getting along well with Bobby, Warren, and Jean Grey. In addition to getting to know them, she also got a feel for the drama going on in the team. At the moment Kitty was sitting on a picnic table with Warren discussing these matters while eating lunch. “That’s just a rumor. I have no idea if that’s true,” shrugged Warren as he bit into his sandwich. “That one I know is true,” smirked the winged mutant. “That’s a grossly oversimplified summery of the whole affair, but yeah,” said Warren, trying hard not to laugh at these strange romantic situations. Kitty paused in a show of bewilderment. Then she laughed hysterically, shaking her head as she tried to put all this in perspective. She knew the world of the X-men was complicated, but throwing these personal issues into the mix couldn’t be helping. “Wow…you guys should start your own soap opera or something!” commented Kitty. “We’ll see,” said Kitty with a wry grin. It was something she never expected from the X-men, dealing with these complicated relationships. It showed just how human they all were. It was an interesting reminder how they really weren’t as inhuman as people thought. They still had a lot of the same problems when it came to relationships. These cases just happened to be really out there. Warren shifted uncomfortably. Kitty just touched on a very sensitive issue for him. His history with relationships was long and complicated. It was also full of heartache. He tried not to let it show with the team, but the pain was still present and it wasn’t something he liked to talk about. Warren shook his head and grinned. It was nice to see Kitty was taking to being an X-man so quickly. But she was getting ahead of herself. It was a phase everybody seemed to go through when they first arrived. The idea of being a hero has that effect on people. “To be fair…you are a little girl,” Warren pointed out with a humored smirk. Kitty shot the winged mutant a bemused glance. Warren shook his head and laughed again. Nobody could ever fault Kitty for not being ambitious. She really was determined to be part of this team. For someone so young, that was saying something. He heard about how her uncle trained her to fight from a young age. It definitely showed in the way she carried herself. That didn’t mean she was ready, but it did put her ahead of the learning curve that came along with all new X-men. With the way things were going with the Brotherhood and Cameron Hodge, she may get her chance sooner rather than later. Not far from where Kitty and Warren were eating lunch, Scott and Jean were taking walk together along the front yard. They had been eating lunch together as well, something they hadn’t had a chance to do lately. With all the drama of relationships and missions, it was easy to miss the little things that they still cherished together as friends. But no matter how complicated their lives as X-men or students got, they always found time to catch up. They tried to avoid topics like relationships, the Brotherhood, and Genosha. They talked about movies, TV, books, and whatever else came to mind. They laughed, joked, and smiled as they had been doing for many years. It wasn’t easy when there were so many other issues they had yet to work out, but it was something they felt they had to do and it was good for them. They shared another round of laughs. There were never any shortages of things for them to talk about. Whether they involved stories from the past or just mindless rambling, they always found something meaningful in it. Jean found herself linking arms with her friend as they walked around the front yard of the mansion. Scott smiled at her gesture and took her hands in his. This was nice. They needed something like this to ease the stress. They had so much going on with their respective relationships and the everyday workload of being an X-man. Scott and Logan were still at each others’ throats and Jean wasn’t getting along any better with Rogue. But they tried to make it work. Even though they may not always support their choice of partners, they still supported each other. As they walked and laughed together, they passed the garage. Inside Logan was working on his motorcycle as he so often did. When he looked up and saw them walking by, Jean waved and blew him a kiss. He waved back, but found it hard to smile when he saw her holding hands with Scott. Jean could sense he didn’t approve. He was always a little antsy whenever she spent time with Scott. Even though she constantly reassured him of her feelings, it still didn’t sit well. They kept on walking and Scott didn’t comment at first, but it was too difficult to ignore. Jean sighed and stopped walking for a moment as she looked back towards the garage. “Guess it was a little naïve to think we could totally ignore it,” she said. It was a daunting notion. Scott rubbed the back of his head awkwardly as he drew a blank for a second. Then he said the first thing that came to mind. “Well…how are you and Logan doing?” he asked. Jean shifted and looked away before responding. “Good luck with that,” said Scott, trying to hide the distaste in his tone. “What about you and Rogue? How have things been going with her?” asked Jean. Now it was Scott’s turn to shift. He and Jean hadn’t really talked much about his relationship with Rogue. They hadn’t really had a chance. With Jean clashing with Rogue so often it was difficult to even bring it up. If Scott could keep his head about her and Logan, the least she could do was be civil when talking about him and Rogue. “That’s one way of putting it,” said Jean dryly. Jean thought about that for a moment. It was not easy to sympathize with someone she didn’t get along with, but she could see where he was coming from. She could also sense that he really did like this girl. It may not be the head over heels kind of love, but it was definitely there. She still had her share of concerns though. “But do you get the sense we’re making those same mistakes again?” wondered Jean. “Yeah…I’m sure,” said Jean distantly. There was a brief silence between them. Scott could tell she was still concerned. Just as much as he had his reservations about her and Logan, she had hers about him and Rogue. It seemed as though they were on the same road, just on different sides. It was a very different road then the one they were on before Logan arrived. For a while it seemed they were heading a certain path together, but fate unfolded differently and now they found themselves in complicated situation. At a loss for words, Jean linked her arm with his again. Scott managed a smile and held her hand again as well. These were not easy issues to talk about. It still seemed a lot easier when they were there to support each other. “Don’t worry, that’s something I’ll never forget,” assured Scott. They kept smiling as they stood together, enjoying this moment. It was a rare feeling of peace in their otherwise chaotic lives. It was comforting to know that no matter how messed up their personal or profession lives were, they were still there for one another. But as they were enjoying this moment, the front door to the mansion burst open and Rogue came rushing out with an urgent look. “Break it up, you two! The Professor just called an emergency meeting in the War Room! We got ourselves a big problem!” she said. “How big?” asked Scott, quickly taking the serious poise as an X-leader should. “Come and see for yourself,” she said in a grim tone. Scott turned to Jean briefly. As much as he would have liked to continue this moment with Jean, urgent matters like these couldn’t wait. She nodded in understanding, knowing just as well how serous this was. Without another word, they rushed back inside along with Rogue. Even as they met up, Jean noticed Rogue giving her a dirty look. Even in her urgent state, seeing her with Scott in such a position did not sit well. But Jean was in no mood to start another fight. Rogue’s look persisted, but she didn’t say anything to provoke her further. She just ran alongside them towards the War Room. For a conflict this big, they would have to set aside their differences. They had much bigger issues at hand. This was a big day for Cameron Hodge. It already had the makings of a day that would be long remembered in the pages of history. The destruction of the embassy in Washington provided the spark he had been waiting for. An attack on Genoshan soil by a team of renegade mutants was tantamount to an all out invasion of once species upon another. What the incident in Chicago failed to provide, the Brotherhood of Mutants delivered without them having to lift a finger. Now the next step could begin. As soon as news broke of the attack on the embassy, Cameron Hodge was rushed to the main research facility on the island under heavy guard. He already delivered a message to his military to instill martial law. Every man, woman, and child of his country would now be subject to wartime measures. That meant everybody was technically a soldier and obligated to follow orders from the top military brass. But Hodge wasn’t under the illusion that his people alone could stand against the coming mutant onslaught. To defeat his enemies, he had something far grander in mind. Security around his main research facility was among the tightest in the world. Nobody without top military clearance was allowed in. If a stray farmer ventured onto their grounds, the guards were allowed to shoot on sight. The facility was already on high alert with troops, tanks, and fighter planes preparing for battle. Some of Hodge’s most elite units were stationed here and were getting ready for what was sure to be a battle for the ages. As Hodge rode by on his armored convoy he smiled. This was what he had been working for since he seized power on this island. Now it was finally coming together. As they rode up to the check point, his personal guards turned back to address him. “They’re ready for you, sir,” said his driver. “Yes sir,” said the driver. The driver relayed the message to the security personnel outside. They respectfully saluted their leader, affirming that his commands would be done. Within an hour this whole island would be one big fortress. It would be a glorious stand worthy of the Alamo or the battle of Thermopylae. But unlike those battles, this one would have a very different outcome. Hodge and his convoy passed through the checkpoint and several others until they drove into a large, warehouse-like opening in the west end of the front building. This facility, one of the largest structures on the island, was a hotbed of research and advanced weapons development. It was here where the fruits of his labor took form and substance. What other countries spent decades developing, he and his regime had attained in a few short years. The cost was high, both in terms of resources and in money. But the payoff was potentially huge. Once the convoys stopped, the large sliding doors behind them were closed and secured. Then every vehicle in the convoy opened up as contingents of Cameron Hodge’s personal guards rushed out and surrounded their leader. Only the lead guard had the privilege of opening the door for him. And when he stepped out they made sure the first person he saw was the man responsible for their progress. He was Genosha’s lead scientists and engineer, Bolivar Trask. “Don’t tell me you’re surprised,” said the Genoshan leader coyly. Hodge and his body guards followed Trask into the bowls of the vast facility. The middle aged scientist/engineer looked as though he hadn’t slept much these past few weeks. Not that anyone could blame him, but he knew this was coming. He knew the part he was going to play. Hodge knew he was taking a risk when he brought this man on board, but this man had the genius and the motivation to do what he needed him to do. He didn’t look like much as he followed him into the primary manufacturing area of the facility. Trask was a short, lanky, pale-faced figure with glasses and an unkempt complexion. He had his share of gray hair, making him look a lot older than he really was. Many mistook him for being in his late forties. But he was really in his mid-thirties. It was a testament to the stress this man had endured. Once the pride of MIT, Bolivar had his share of bad luck. It was that bad luck that became Hodge’s golden opportunity. Following close behind the anxious man, Hodge and his entourage was led to the primary observation deck of the manufacturing area. This part of the facility was a noisy, chaotic place. Teams of scientists, engineers, technicians, and workers labored around the clock on the pride and joy of the Genosha military. As they passed by, onlookers paused and saluted their leader. But quickly went back to their tasks, working at a feverish pace under the watchful eye of their dear leader and his armed men. Hodge smiled at the fear he instilled in these people. It would make them work harder at this most pivotal time. Trask fell silent. This wasn’t the first time he inquired about these advanced components that Hodge had been able to provide him with. They were decades ahead of anything the rest of the world had. Technology like that didn’t just come from nowhere. But Hodge, like the rulers before him, were very secretive of where this technology came from and Trask wasn’t about to risk losing it. “Now then, what is the status the demonstration I’ve organized?” inquired Hodge. “Have you had any problem with our participants?” asked Hodge ominously. There was a strange undertone to Hodge’s words. He seemed to imply there were bigger targets out there. Trask wasn’t aware of anybody more formidable than the Brotherhood and the X-men, but he trusted his old friend’s foresight. He just provided the means. Hodge provided the strategy. “Good, I look forward to seeing your creations in action,” grinned Hodge. Hodge laughed and placed his hand on his old friend’s shoulder. Trask was a brilliant man, but he was too anxious for his own good. Given what he had been through in his early life, he could hardly blame him. But that was the past. This was about the future. News reports from several different countries were being streamed into the War Room all at once onto the central holographic screen. They all covered the same ghastly scene at the Genosha Embassy in Washington DC. Images of rubble and charred ground dominated every moment. It was as if they were broadcasting from a war zone, but being in the nation’s capital struck hard and it was sure to leave an impact on the millions of viewers all around the world. But the one scene that kept playing over multiple times were the video feeds that came from the security cameras that hadn’t been knocked out. They showed clear as night and day the three Brotherhood members responsible for this carnage. Avalanche, Quicksilver, and Pyro showed little hesitation or remorse for what they were doing. Even though the video image was not of high quality, they could tell they were enjoying this attack. They knew what their actions were going to stir in the course of world affairs and they didn’t care one bit. Professor Xavier’s expression was grim. His X-men shared his grave demeanor. Scott, Jean, Bobby, Warren, Hank, Ororo, Logan, Rogue, and Kitty all turned to their mentor for their next move. It seemed as though the peace they had been fighting for was an afterthought. The Brotherhood had made their move and now conflict seemed inevitable. “Please tell me we get to beat them to a pulp, Professor,” groaned Bobby. Professor Xavier sighed as he turned off the broadcasts and addressed his team. It got everybody thinking. It did seem a little odd, given what they knew about Magneto. This was something he could have easily done months ago. For him to choose now of all times seemed too random. Magneto was a lot of things, but he certainly wasn’t irrational. “You mean besides getting people all around the world to start fearing mutants?” said Warren dryly. “Is that something we can take at face value?” Scott inquired. Ororo had a point. It was a daunting notion given that millions were probably glued to their TVs watching this dire news. But the more Xavier watched it the more it bothered him. It was bad by every measure, but something about it just didn’t sit well. He couldn’t put his finger on it, but he had a strong feeling that there was something else to this affair that everyone was missing. He directed his attention to one of the broadcasts that was reporting on the layout of the Genosha embassy. It was nothing shocking. It just outlined how secure the area was and how much money Cameron Hodge poured into protecting it. Then he saw another message stream across a graphic. The embassy had been on high alert at the time of the attack. And yet they barely put up a fight. The Genoshan officials just capitulated, as if their forces weren’t even trying to resist. That sparked the Professor’s curiosity. “Hmm…I wonder,” he said distantly. “Please tell me we have a plan, Professor,” said Kitty. Then some of the others started following his line of reasoning. “Unless he expected them to attack,” realized Scott. “Perhaps he even wanted him to!” added Hank. “Why in the hell would Hodge want the Brotherhood to attack?” said Rogue skeptically. “And a perfect means to demonstrate these mutant containment systems he’s been boasting about,” said Xavier. This situation was getting more complicated by the second. Looking at the broadcasts, it didn’t seem so clear cut anymore. The Professor had good initiation about this sort of thing. There were too many inconsistencies to ignore. If there were other forces at work then that had to be their focus. If there was even the slightest chance that they could uncover the truth, then maybe this war could be averted. “So what do we do?” asked Ororo anxiously. “Seeing as how I still have the bruises from that last fight, I’d rather not,” groaned Kitty. It was an ominous notion, facing something similar to what they faced in Chicago. That weapon was too advanced to write off. If Hodge’s plans were as big as he claimed, it was difficult to contemplate what else he had in store. If Magneto really was going to attack, he wouldn’t hesitate to use them and that didn’t bode well for anybody. “Which is why I’m going with you,” said Xavier as he turned off the computer. “What? !” exclaimed half the team simultaneously. “Ha! No offense, Chuck. But you ain’t exactly conditioned for combat,” said Logan, gesturing to his wheelchair. “Does that mean you’ll break into his mind and extract his thoughts?” asked Kitty. They were strong words from a man who was very limited physically. Nobody could ever fault Charles Xavier for having guts as well as brains, but a mission like this was still risky and contained potentially difficult decisions. “Are you sure about this, Professor?” asked Scott, already concerned about how they would go about this mission with their mentor in the line of fire. “That’s noble of you sir, but Wolverine is right. You’ll be putting yourself in harm’s way,” said Jean anxiously. They all knew Charles Xavier well enough not to argue. He made his decision and he wasn’t going to let anybody stop him. It was brave for someone in his condition, but foolish as well. He was not a fighter by nature, but was willing to go to great lengths for his dream. Men like Cameron Hodge and Magneto were determined to propagate their madness. It was only fitting that Charles Xavier was equally determined to stop them. Nobody said a word as they followed their mentor out and prepared themselves for battle. They had a daunting task ahead of them. They were going to a nation run by a madman who made a political career out of demonizing mutants. In addition, that same nation could be attacked by Magneto and untold hoards of mutants at any given moment. The X-men were thrusting themselves into the crossfire of a potentially devastating war. If they didn’t stop it then Xavier’s dream would officially become a nightmare. The only one who lingered for a bit was Kitty. She had been training something like this, but she had never taken part in it. She tried to be strong, but she couldn’t help but be a little intimidated. All she could do was set her fear aside and follow the others. Her parents and uncle always wanted big things for her. It couldn’t get much bigger than this. “Follow me, Kitty,” said Jean. “Please tell me I’m getting my codename now. I’m not going to sound very heroic if I just go by the name, Kitty,” she said. In times of peace, the president’s office was chaotic enough. In times of war, however, the tension was beyond measure. Decisions that could affect the lives of millions if not billions were debated and made within these walls. No president ever wanted to be in office when a major conflict broke out. But as history had shown time and again, conflict of the greatest magnitude can break out at any time. At the moment the president and his staff were dealing with such a conflict. The destruction of the Genoshan embassy sent shockwaves throughout the international community. Countries all over the world were scrambling to find out everything they could and prepare appropriately. The big question on every leader’s mind revolved around one specific issue. What was going to happen with mutant relations? This attack could very well usher in a war between species. If the ominous images of the Brotherhood attacks were any indication, it was bound to be devastating. Sitting behind his desk in a daze, the president listened to his most trusted advisors. Among them were his secretary of state, his secretary of defense, three of the joint chiefs, and a well-known senator from New York named Robert Kelly. Normally, congressmen were not allowed in meetings of this nature. But Senator Kelly was an up and coming star in the political world and a major voice in the mutant issue. He offered his own perspective along with the normal logistics his advisors and generals offered. “A war that was bound to happen sooner or later,” Senator Kelly pointed out. “With all due respect, Senator, it’s a war that had best happen later. And during someone else’s administration,” said the secretary of state, who was right next to the president. Senator Kelly scowled the secretary’s remark. But this heated debate was going nowhere and they all knew it. The President could only listen and contemplate what to do next. He hadn’t said much since the conversation began. He was too lost in thought, trying to wrap his head around the situation he found himself in. Presidents before him had faced tough decisions. When he ran for office he understood he may have to make a decision to go to war with another country. But this was no ordinary war they were dealing with. This was a war between two species. Six and a half billion people stood against thousands of mutants, each with survival in mind. One side feared the other and war would only propagate that fear to irreversible levels. Whatever he decided, he had to decide carefully. The fate of millions may depend on him. “Mr. President…” Senator Kelly began. “And where exactly did he get the materials for that?” asked the President. The President muttered a curse under his breath. So many countries were quick to criticize America’s policies, yet when the important issues came along they turned to them without so much as a polite inquiry. The secretary of state took over from here. Both outcomes were hardly desirable. It seemed lose-lose no matter who succeeded. The President’s expression sank for a moment as he digested every scenario he could think of. “Is there any possible outcome that may be remotely positive?” he asked desperately. None of his staff said anything at first. But then the secretary of defense stepped forth. It was a faint glimmer of hope in an otherwise hopeless situation. The President was not keen on placing his faith in a group of renegade mutants run by a mysterious man like Charles Xavier. But if they could do something to stop this war it was worth giving a chance. He had few other options. He was a lame duck president on his way out of office. He had little public or congressional support and any controversial decision was sure to be scrutinized if not torn apart. He would not leave office with that kind of legacy. With his general’s words in mind, the president sighed and made his decision. It wasn’t the most assertive decision, but it was all he could do for now. “For Hodge or the mutants?” asked one of the joint chiefs. “Yes sir,” his joint chiefs and secretaries stated. “Good, then make it happen,” the president ordered. His staff complied with their commander-in-chief’s requests and ran off to carry out their duties. The President got up from his desk as well, needing a moment to collect himself after making such a decision. The only one who didn’t move was Senator Kelly, who remained stoic and unimpressed by the president’s decision. It was nowhere near what he wanted. Just letting this mess unfold was the same as doing nothing. For all he knew this could be some sort of endgame for the mutants. At least with Hodge they had a chance at fighting back. He long suspected mutants would rise up like this. It was why he pushed so hard for mutant regulation policies. If this affair didn’t pan out in their favor, then humanity would be in grave danger. “And what if we’re too late? What then?” said the Senator firmly. The President’s expression then became solemn again. The commotion throughout this normally secluded area had reached a fevered level. Under cloudy skies and brisk winds, hundreds of mutants converged. They came from far and wide. Some were former Morlocks. Some looked completely human. Some were young, a few not even teenagers. Others were old, looking as though they had endured humanity’s intolerance one lifetime too many. They came by bus, plane, and car. There were even those that came on foot, using their powers to endure the journey. Others with flight powers gathered others and flew them in. Some even had teleportation powers, allowing them to bring in mor. Then there were those that came from around the world. They had to be flown in via large transport orbs, programmed to pick mutants up from specific areas around the world. For the past two hours, the sky had practically been raining down orbs full of mutants, looking to join the battle. It made for what was by far the largest mutant gathering in recent memory, if not ever. The setting was unimposing. This place was just an abandoned rock quarry, half of which had been flooded by rain already. But it was the perfect staging area for the first true uprising of the mutant race. Here mutants could gather around and appreciate the sheer scale of this moment. Never before had they come together with such unity. Even for those hardened by the intolerance they endured, it was an emotional sight and at the center of it all was the man who brought them together, Magneto. Standing in the center of the quarry with his Brotherhood, Magneto watched as mutants poured into the area. It was just as he hoped, mutants from all walks of life coming together to stand against their human oppressors. He saw in them a sense of excitement and even a little desperation. Like the rest of the world, they saw what happened in Washington. They heard the fiery speeches of Cameron Hodge and others like him. They could no longer afford to wait idly for humanity to wipe them out. They had to stand and fight for their rightful place in the world. While the sight of so many mutants was welcome, Magneto still felt this gathering was undermanned. There could have been so much more if only his plans to strike fear into humans had worked. Were it not for Charles Xavier and his X-men, he could very well have the whole mutant race in this one area. But there were still plenty of mutants to do their part. One way or another, they were going through with this uprising. Either they would succeed, or go extinct trying. “But fewer numbers may lead to greater casualties, father,” reminded Wanda. “But do you think they’re ready for this?” his daughter asked. Not everyone shared Pietro’s confidence, but having so many mutants on their side was encouraging. It would lend strength to their uprising, sending a message to all humanity that mutants weren’t going to take being oppressed. They were the superior ones. They were the ones with the power and soon all of humanity would come to know as such. It was almost time to begin. The last batch of transport orbs landed letting out the last wave of mutants. The others that made the trip through other means also made their way into the quarry where they joined the growing crowd in the center of the large rocky pit. There was a great deal of commotion. Some were already clamoring for the battle to begin. Others were confused about where they should be. Their only unifying force was Magneto, the man who summoned them. Upon sensing that every mutant was here, Magneto made his presence known by using his powers to levitate himself high into the air so everybody could see him. To silence them, he literally tore slabs of ore from the surrounding cliffs and started swirling them around himself and the crowd. With the rocks swirling and the winds kicking up, every mutant that heeded Magneto’s call gazed up and listened to their leader. There was a look of seething intent as Magneto mentioned the death of his parents. It always stirred his deepest hatred for the human race. And that hate reverberated throughout the frenzied crowd. A great round of cheers erupted from the audience. Their desire for revolution had been stirred. The mutant community had been waiting a long time for someone like Magneto to come along. He was the leader that would lead them out of this world of oppression and injustice and into a new age. Humanity had its shot and now it was time to give way to a new mutant dominated order. In a show of overwhelming power, Magneto summoned the full force of his powers. The veins in his head and neck bulged as he forced a massive chunk of iron ore the size of a stadium out from the rocky ground beneath them. This massive or was big enough to hold them all. Some were shocked by this show of power, but many cheered Magneto on as he used his power to flatten and shape it into a giant metallic disk that would carry them across the world. With a determined grunt Magneto flew towards the horizon, guiding the massive disk with him that contained his mutant army. Together they headed east towards the shores of Genosha where the forces of Cameron Hodge awaited them.